The Storm® Lotus range adds that final polish to your bathroom, featuring the latest in design, practicality and aesthetics. The Storm® Lotus Hand Shower and rail Set is all about simplicity and minimalist design. It's rounded geometric curves and sleek chrome coating provides a timeless architectural look. The European design of the hand shower and rail provides practicality and function. With an attached round soap table and double spiral flexi-hose, the Lotus Hand Shower and Rail Set is the ideal unit for your contemporary modern bathroom. A shower to set everyone! Classic round rail design - Classic Round design with round tube rail, chromed finish and matte grey faced shower heads. Looks fantastic on display. 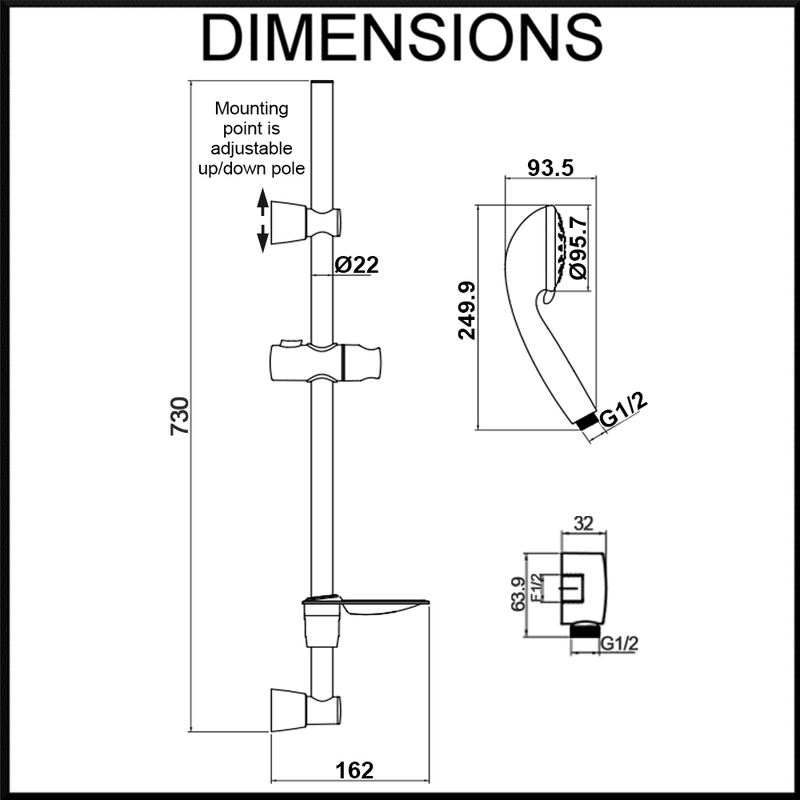 Fully Adjustable - Adjustable angle tilt and height on the shower head holder, this allows you to customise your showing experience to your specific requirements. 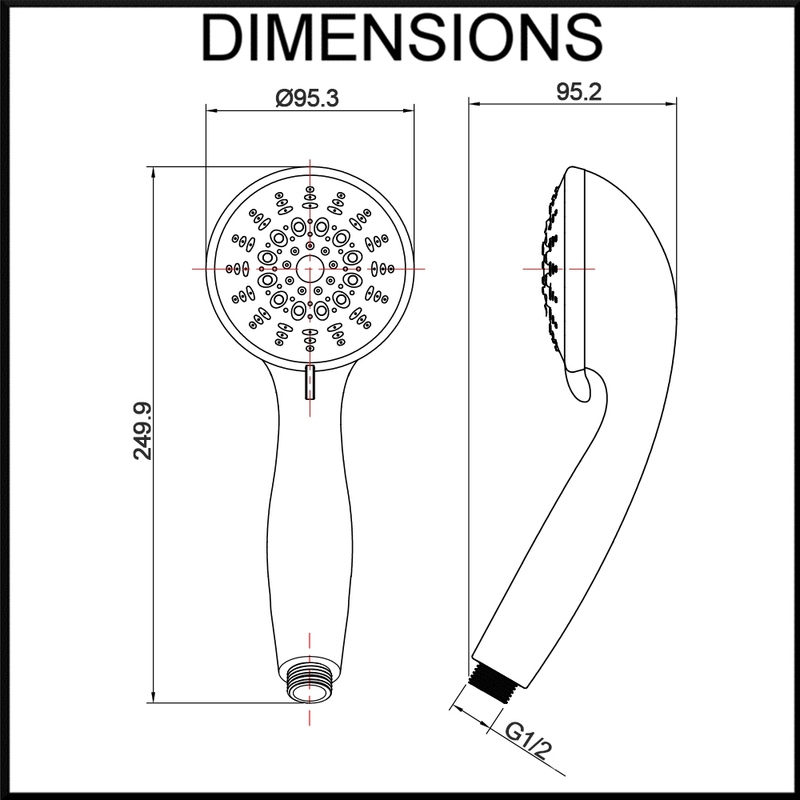 Mutifunction hand shower - Highest quality over sized 96mm diameter seven function hand shower. Switch between functions effortessly with a twist of the head, to create unique and luxurios shower experience..
High quality hoses - both the hose from the water inlet and the hose to the hand shower are flexible chromed stainless steel. They include an EPDM sanitary liner so impurities do not build up over time. Integrated soap tray - Integrated matching chromed soap tray for convenience and the minimalist look. Easy installation - Includes everything required for full installation including matching female thread input wall elbow to connect to standard male thread wall connection (½ inch BSP). 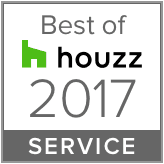 When buying shower systems ensure they are truly compliant. They will have the Watermark logo on the product including the licence number. Otherwise your plumber is not allowed to install them. Consider your budget - full metal shower sets are more expensive, yet all should be very stable and reliable once installed on a wall. Storm® Showers are designed to be a great value for money choice - reliable yet inexpensive. The Storm Shower Range has been a pioneer in Shower Technology for decades, the latest example being the Air-Turbo Technology featured in a hand shower saving up to 30% less water whilst not jeopardising your showering experience. When it comes to Quality Storm is rivalled by none, whether its the flawless Chrome finish or the long lasting construction Storm optimises Quality in every element of its products. Lotus 96mm diameter 7 function hand shower, Fitted with 3 Star Wels rated and licensed flow restrictor for up to 9 litres per minute flow. Chromed ABS body. Matte grey face and dark grey jets. Chromed flexible Stainless Steel hose for flexibility in the shower. Hoses include inner EPDM tube liner. Includes 150cm hose from pole to hand shower, and 80cm hose from wall elbow to pole/diverter. Ideal pressure: 100 kpa to 500kpa. Not recommended for gravity feed systems.